The first programmers started out as "Computers." This was the name given by the Army to a group of over 80 women working at the University of Pennsylvania during World War II calculating ballistics trajectories - complex differential equations - by hand. When the Army agreed to fund an experimental project, the first all-electronic digital computer, six "Computers" were selected in 1945 to be its first programmers. They were Kathleen McNulty Mauchly Antonelli, Jean Jennings Bartik, Frances Snyder Holberton, Marlyn Wescoff Meltzer, Frances Bilas Spence and Ruth Lichterman Teitelbaum. They had none of the programming tools of today. Instead, the programmers had to physically program the ballistics program by using the 3000 switches and dozens of cables and digit trays to physically route the data and program pulses through the machine. Therefore, the description for the first programming job might have read: "Requires physical effort, mental creativity, innovative spirit, and a high degree of patience." In 1947, the ENIAC was turned into a "stored program" computer, the world's first. Thus, these six programmers were the only generation of programmers to program it at the machine level. Marlyn Meltzer and Ruth Teitelbaum were a special team of ENIAC programmers. As "Computers" for the Army, they calculated ballistics trajectory equations painstakingly using desktop calculators, an analog technology of the time. Chosen to be ENIAC programmers, they taught themselves and others certain functions of the ENIAC and helped prepare the ballistics program. 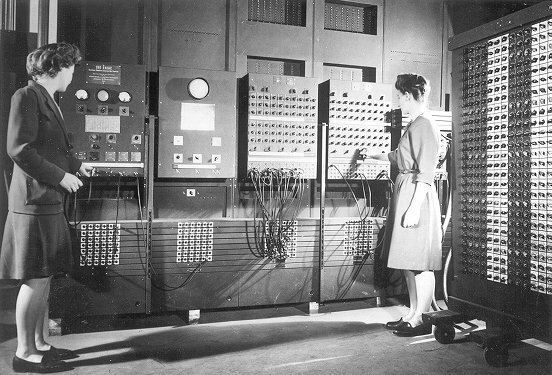 After the war, Ruth relocated with the ENIAC to Aberdeen, Maryland, where she taught the next generation of ENIAC programmers how to use the unique new computing tool.